CALIFORNIA GOLD & WINE COUNTRY! Located in the Sierra Foothills just outside of Sacramento and close to 60+ award-winning wineries and Amador Flower Farm. Explore California's historic Gold Rush towns or simply relax & rejuvenate at 49er Village RV Resort. I would give it 4 stars but...The good and the bad. There is a lot of good: Location is great, within walking distance of a good supermarket and a few wine tasting rooms, as well as the fairgrounds. The park itself is fairly nice with good sized spaces although backing in a 5th wheel might be tricky for some. Great new WiFi system that is very strong and reliable although of course they throttle bandwidth so you can't stream, but can do chores like Facebook. Night security is good, they pay attention to who comes and goes. 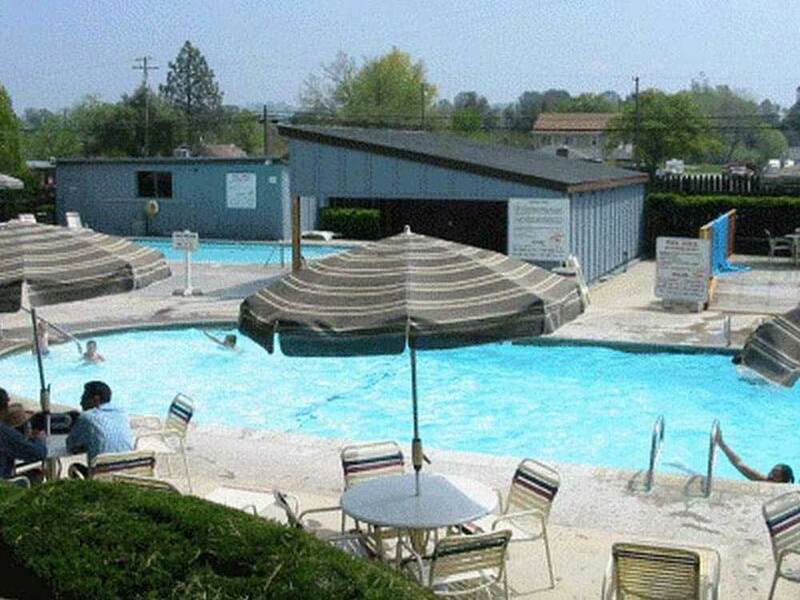 The two pools and hot tub are clean and well maintained. Trees are decently maintained as long as you can drive down the middle of the lane, but if you have approaching traffic forcing you into your lane there will be scratching. The Bad: It gets down to management. My grass area was just loaded in dog crap, and so obviously endless flies. Grounds crew should have policed the space after last party left. The flies were relentless to the point the grass area was not usable. They also leave the sprinkler system on every night so all our chairs, table clothes - the works - got soaked. Again, grounds people not being properly trained. When the grounds people used their leaf blowers to clear pads they didn't bother to direct the dirt away from occupied spaces, which they could have done, but simply blew it directly into our camp which given that things were wet from sprinklers made a mud mess. And the grounds people do their noisy activities like leaf blowers and riding mowers in the late afternoon when most campers are trying to sit outside and enjoy conversation. Could do it at maybe 10am and be fine. All of this is poor management/training. So in summery, if you are the type that just likes to sit inside your rig all day, this park will be fine for you. But based just on the relentless flies alone I won't go back. Note: I learned that they have a new manager, been there two months. Maybe he can get these issues dealt with, so keep an eye out for reviews later than mine. Have stayed at this park on several occasions, this will be the last. The park is old and in need of upgrades to their sites, it was originally designed back in the sixties for smaller rigs, big challenge maneuvering the park. Backing in the sites is a visual event for onlookers if you are not the person parking your rig. Also if your space is on the east side of the park you will get a lot of road noise from the Hwy. The park personnel/management need to be given an education in customer service, they were rude and very unprofessional, if someone has an issue, you don't run into the neighborhood yelling and screaming at people. Respectful conversation will go a lot further, could not believe how they treated a neighbor RV'er. We don't usually use the public restrooms, but they looked clean. The duck population is out of control, along with the messy poo they leave behind, don't leave anything out they will take it. On the positive side there are a lot of things to do like wine tasting and site seeing. Camped here many times. Great place for holidays like Halloween and New Years Eve. Facility is self contained, meaning it has virtually everything within its gates to entertain, including enclosed pool. Well managed. Easy access to groceries virtually across the street. We loved our stay. Nice wide level site with grass and plenty of shade. We took our dog and enjoyed the walking trails around the ponds, ducks, and campground. Very clean restrooms and close to wine tasting. We will definitely stay here again. We love this campground and have returned numerous times. There are so many mature trees that provide a great deal of shade as well as beauty. We traveled with 2 other couples and had plenty of room outside for all of us to gather and share meals. The pools are clean and inviting. My only complaint on this stay was that a large group of adults in the adults only pool continued to allow there children into the adult pool. My compliments to the staff who quickly responded. Unfortunately, this large group continued the practice. But this is the only time that we have experienced this in our many stays at this resort. We plan on returning many more times. The facility has a variety of well maintained, level, paved sites with plenty of shade and grass. Restrooms have private, tiled showers. The clubroom is adequate for groups, and the pool and play ground area are great. A store with sandwiches, ice cream, etc. is on property. Plenty of area activities available including some of the best wineries in the state, and great restaurants (Marlene & Glen's Dead Fly, Pub downtown, Taste for fine dining, Cocina del Oro). Pokerville Market is right across the street. Our favorite park until last 2 years when rates have become outrageous causing us NOT to return as often as individuals. Sites are OVERPRICED ($52-84) if you are NOT part of a club. 49er card ok but not big savings as just couple $$ more than Good Sam. You have to visit often to get any significant savings and you don't accumulate points with a club. BEWARE: there are so many different types of sites with different prices. The pricing doesn't make sense and is ridiculous. No weekly rates. The cancellation policy is too strict for groups (full payment, no refund) if less than a week's notice, and they adhere to it strictly.